Discussion in 'Design and Graphics' started by Nostromo, Aug 30, 2011. While I'm still playing around with Blender I will definitely get one of the pay-for packages. I was already set on getting into Maya when I read about changes in the cgi landscape. These are the things I read. Feel free to comment and put in your point of view and say where you think something's not right. While the talent pool for Maya is very large, so I read, but Houdini seems to be getting into first spot. I also read that thing take much longer in Maya than in other 3D software packages, because it's an "older" software. Many people say Maya's interface is unintuitive and horrible, but others say that it's actually excellent. I don't have any interest in cartoons. I'm much more interested in photorealistic animation. Houdini, a very hard to learn software, is said to be not top nodge in modeling, but in special effects and also compositing. If you use Maya or Houdini I'd love to hear from you. i use both. houdini has become a little easier to use lately but no 3d package is going to be "easy" to learn. it takes work just like everything else. Houdini's set of tools are mostly implemented as operators. This has led to a higher learning curve than other comparable tools. It is one thing to know what all the nodes do - but the key to success with Houdini is understanding how to represent a desired creative outcome as a network of nodes. Successful users are generally familiar with a large repertoire of networks (algorithms) which achieve standard creative outcomes. The overhead involved in acquiring this repertoire of algorithms is offset by the artistic and algorithmic flexibility afforded by access to lower level building blocks with which to configure shot element creation routines. In large productions, the development of a procedural network to solve a specific element creation challenge makes automation trivial. Many studios that use Houdini on large feature effects, and feature animation projects develop libraries of procedures that can be used to automate generation of many of the elements for that film with almost no artist interaction. What does "familiar with a large repertoire of networks" mean? Does it mean that there are complex processes like words in a language, and if you don't know all these words/processes you can't do much? In short, is Houdini only for people who constantly work with 3D applications, and is inaccessible for those not specializing in 3D? It may be easier to recommend if we know more of what you plan on doing. Maya IMO is easier to learn than Houdini, but Houdini isn't hard. If you have ever used UDK think of Houdini kind of like Kismet. Its procedural based so you kind of add custom attributes as you go down the chain to achieve the desired effect. There is more to it but its the easiest way I can think to explain it. Honestly you may want to look at a few tutorial vids that may explain it a bit better. I'm looking to work on photography background, creating landscapes and cityscapes, all photo realistic. I would be interested in creating creatures, but I definitely like the photorealistic look. I would love to use it for video later. My key interest is that 3D work is photorealistic. I am also keen on setting up the lighting on this 3 D work. Which software could do this better? PS: What do you mean by "UDK"? I have started with Blender (whose interface I do not like, but I just started to get some ideas about 3D before buying into one of the software packages). My most used software is Photoshop cs5. UDK is Unreal Development Kit and it has a feature called Kismet that lets you use nodes to create effects and gameplay by dragging icons and changing values. Most people have never used it outside of the game development community. As for photorealistic renders pretty much all packages can do it, it depends on how much you learn about the renderer. 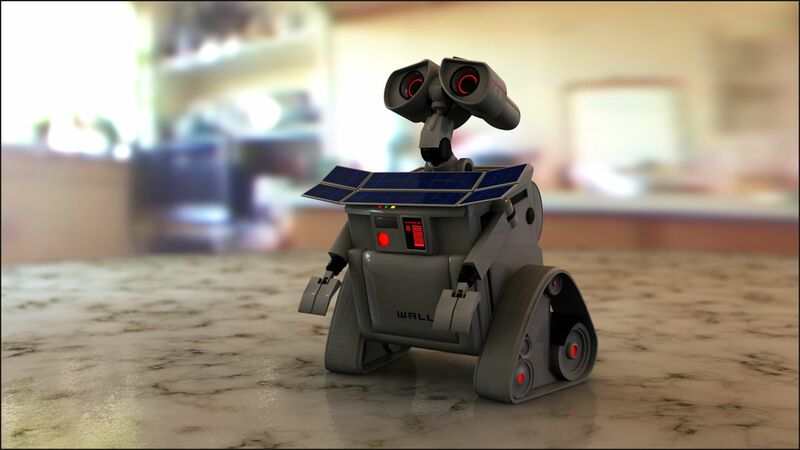 Cinema 4D has actually become quite a popular choice recently and one of the forum members has been making some really nice renders of a robot from the movie Wall-E using Cinema 4D. The post was yesterday I believe. Its much cheaper than Maya and Houdini (as long as you don't get the most feature rich package). It is also known to be much easier to learn. Neither Maya or Houdini have nice UI's. Yes, I heard about Cinema 4D and that it's the best for 3D newbies. Houdini and Maya offer student pricing. There's a Maya class at Santa Monica College, and then you can buy the whole package for $350. Houdini has a student edition for $99 a year, limits animation resolution to 1080p and no limits on still resolution. As for Cinema 4D I have not heard of any way around full price which is steep. First you figure out what you plan on doing with the software and what your budget is. If you plan to go work for someone, vs doing your own thing, is going to dictate the software you use. You are asking us what is the best vehicle to drive across the country in? Well... are you planning on going on the freeway, or taking the backroads? How many people are going with you... etc. How much money do you have to spend? Houdini for an individual doing his own work flow is overkill. Houdini, and Maya somewhat, are designed to work on large projects with custom work flows. The reason they are so cheap for students is that they assume that they will go on to work at large studios. They both have steeper learning curves (but all 3d is complex) than most packages. Unless you love to be intellectually challenged... as in, you're more interested in the software than creating anything with it, then by all means... knock yourself out and buy Maya or Houdini. But, there are other programs on the market that do amazing job at photorealistic renders. The only limitation is the skill and artistic vision of the operator and the speed of the computer. Again, unless you plan to work professionally in the industry, you shouldn't worry about the latest and greatest in the industry. But, if you ever plan on applying to work in Hollywood doing 3d, then learn Maya, Houdini, AND Cinema 4d (although, Cinema 4d is geared more towards broadcast). They probably won't even bring you in for an interview if you don't know Maya... unless you have an AMAZING reel. That'd be me, and this would be my latest render: http://i.imgur.com/Urngb.jpg (He's not finished yet though!). Whilst it isn't *as* widely used as Maya for example, it is getting quite popular, and version 13 looks amazing. It was used quite extensively in Disneys Tron to render VFX etc, check out the links below. More studios are using it nowadays. That all being said, Houdini is pretty damn good, Im yet to have a good play with it. Im all self taught and only do this as a hobby so forgive my noobish render and input! My goal is NOT working for a studio. I'm a photographer who wants to add 3D to his work. And, no, I don't have a technical approach to software, but a tool approach. I see a complex interface as a kind of resistance. Anyway, I'm going to need a new computer for this. My current machine will simply blow up rendering. And it looks really great! My first 3D project (in Blender) was a robot made of primitives. He looked like the last look of someone before he was rolled over by the robot and his six wheels. I like the Tron samples. I do believe they're on the Tron OST, yep. I have been using Maya for about ten years now and it is a great program, by far the best for certain things. If it is the UI that you are worried about, that can easily be changed with some MEL scripting (Maya Embedded Language). I also use C4D because it is quicker to do things for broadcast in it and they have really stepped up their render engine. But if all you want to use the 3D program for is landscapes/cityscapes, I would probably refer you to Terragen, which IMO is the best for landscapes and can be integrated with Maya if you want to animate. There is also a Teragen plugin for C4D. The latest Teragen can achieve amazing results with relatively little work. I just downloaded Terragen. I was surprised to see it is free. Cannot expand it as Stuff-it archives are not supported. I'll download Stuff-It expander and try again. Currently I'm learning Blender. This will show me which ways I prefer and which I don't like. It's free so I don't lose anything. How much would you say is access to great classes worth? I'm close to Santa Monica college who offer a wide range of Maya classes, but no classes in Cinema 4D. I'm self-taught in Photoshop and I know from experience that it takes longer to learn software that way as your learning isn't that structured.